On today’s podcast, I chat to Chris Garner, Chief Marketing Officer at Oyster Protocol, a website monetization and distributed storage solution built on the IOTA and Ethereum blockchains, that completed its ICO for its token in November last year. 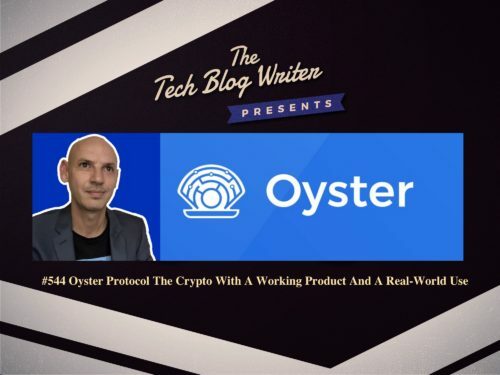 Oyster Protocol recently reached a beta milestone of 1 Million transactions of encrypted data via its new decentralized storage and encryption service, Oyster Pearl (PRL). The announcement came amidst several high-profile data hacks on companies such as Facebook and Dropbox, which rely on email and passwords for security. By utilizing decentralized storage, Oyster effectively works as a puzzle. Files can be broken into many pieces – each piece is then individually encrypted. On its own, each piece is useless to hackers or other third-party observers. Anyone who uses Oyster Pearl essentially purchases a utility token pegged to the size of data storage that they can use to upload. All of this data is anonymized and encrypted with just one private key referred to as the Oyster Handle. Without the Oyster Handle, the uploaded file is inaccessible. Users can trust that any file uploaded by the Oyster Protocol will be accessible only by the user and that their data will remain secure across the Oyster network for the time period purchased. Chris Garner has been recognized by Deloitte Tech Fast 50 for two years in a row and has more than 17 years of experience leading marketing, customer service and technical development teams for companies including Apple, Amazon and Ali Baba. Chris reveals his thoughts on new protocols that can power new business models for digital publications. We also discuss the dynamics of alternative monetization and how the advertising industry is currently broken.